A unique mobile phone holder, the Moby Pad has a non slip, tactile rubber surface that clings to your mobile phone. The sleek design of this product allows for a large printing area and ensures that your company does not leave the customer's mind. 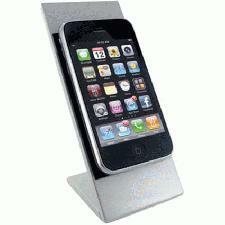 The stylish desk accessory not only makes your phone look great, but it makes your business look even greater! Why not take a look at our Foldy Mobile Phone Holders or The Wedge Mobile Phone Stand if stylish mobile phone desk accessories are your thing. For prices on these products fill in the form and we'll get straight back to you.